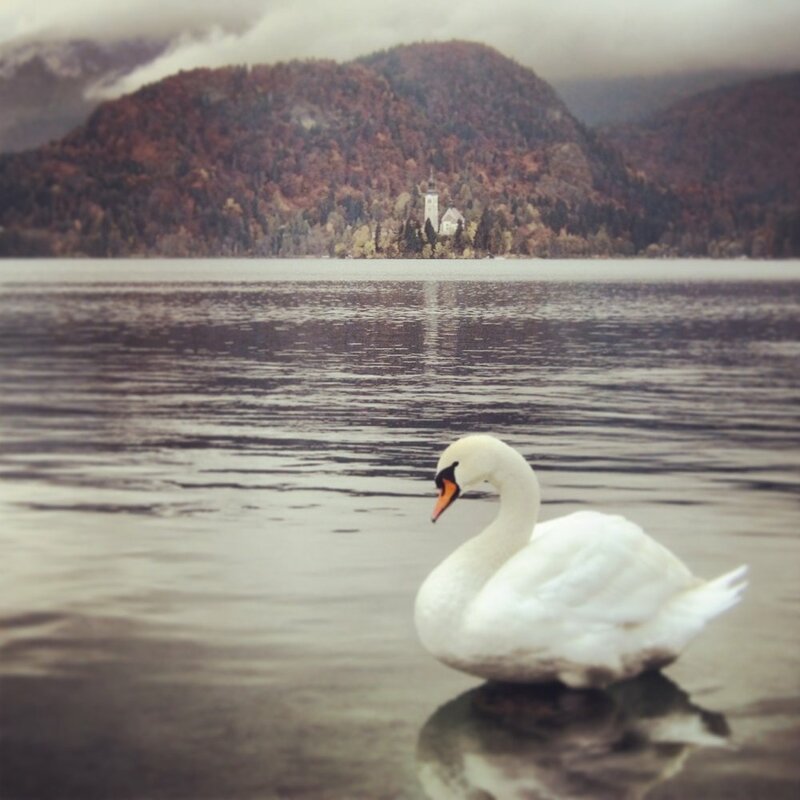 The Lake Bled area of Slovenia is often referred to as fairy-tale like. A castle sits perched high on a cliff, overlooking a church placed perfectly on an island in the middle of a gleaming lake. The neighboring mountains are dramatically tall and create an ideal backdrop for the magical town. While in Croatia on a sailing trip, our guide said it is the place where he goes every year to recharge his batteries. I didn’t know if a place could possibly live up to such hype - particularly in a country that not many people outside of Europe could place on a map. Lake Bled's island church and clifftop castle. Our bus pulled into the Lake Bled stop and we started our walk around the lake to get to the village of Old Bled where our apartment rental was located. Two minutes onto the lake path and I was stopping to pull out my camera. It was that beautiful. Over the course of five days, I amassed quite a collection of photos of the lake on my camera. I promise not to bore you with them all in this post, but the lake has so many different looks based on the time of day, weather and where you’re standing that it was worth its own photo gallery. Swans are all around the lake. Many people visit Lake Bled as part of a day trip around the area known as Triglav National Park. In the early 20th century, a scientist by the name of Dr. Albin Belar proposed the idea of creating nature reserves in Slovenia and his suggestions of developing the preservation of the Triglav Lakes Valley eventually became Slovenia’s and Europe’s first national park. We stayed in Lake Bled for five nights, a significant amount more than the regular visitor, and we left with a list of things we still didn’t get to do. For outdoor enthusiasts, this seemingly quaint place has a mind-blowing number of activities. Walk the lake For most people, this is the one thing they will do in Lake Bled and it is a great start. Every vantage point along the lake provides a unique view of the mountains, the castle and the island. Each time I looked at the castle, I expected Rapunzel to be letting down her hair. At different points of the year, the water takes on different colors - most notably a bright turquoise green in the summer. When we were there in mid-October, the colors of the fall leaves stole the show. While walking along the lake there is also a path up to the castle. There is an entry fee to visit the castle, but if you walk around the non-entrance side along a small footpath, you can get the lake view you need without going in. Peeking out the castle walls. See the lake from high above The view is spectacular, but you have to work to get there. On the west side of the lake is a trail leading up to the Mala Osojnica viewpoint at 685 meters. It is a steep ascent on a rocky path and even more challenging after a day of rain coating the fallen leaves. A steel staircase of 80-plus steps takes you up to the first bench. Stop for a breather, but keep climbing up to the main viewpoint with no obstructions (but be careful, I slipped on a rock and almost went tumbling down the side of the hill!). The trail is a loop so no need to turn around and go back the way you came. The path is easier to navigate on the descent if you follow the loop. Could a place get more beautiful? The view from above. Walk through a gorge One of the highlights of the area is the Vintgar Gorge, and for good reason. Its winding boardwalk and trails lead you through a magical space of high cliffs, rushing water and waterfalls. It is not to be missed. You can walk from Lake Bled to the gorge by taking the main road out of town toward Spodnje Gorje. You will see signs for walking to the gorge. Follow the walking signs to avoid the road with more car traffic. It’s a beautiful walk past small village houses with the mountains looming in the background. The boardwalks of Vintgar Gorge. Bike to a mountaintop hut Not for the faint of heart or out of shape, but those up for the challenge are rewarded in the best way. Cycling out of Bled and passing the towns of Kortino, Bodesce and making your way through Lancovo and Spodnja Lipnica, you will eventually see a road sign for Talez Hut. Described as a “hunters’ hut,” it is actually a restaurant perched on the mountainside with commanding views of the entire area. The 4 kilometer road up to the hut is relentless and most suitable for mountain bikes, and I have no shame in admitting to pushing my bike up in order to finish. The view from the Talez Hut. The beer is cheap, the view is incredible and their strukli is top notch. This document provides the information on the cycling route (route 1). Homemade strukli at the Talez Hut. All this activity needs a reward and Lake Bled is home to one of the best sweet treats in the country. Kremna rezina, commonly referred to as Bled cream cake, is a local specialty well deserving of your time. The custard is topped with a light and fluffy cream, all encased in a crispy pastry dough. While I loved the cake at Slascicarna Smon, I have to give credit where its due to the Park Hotel, the original cream cake establishment. The day I had their version, it was lighter and fluffier than Smon’s and just a tweak better. Bled cream cake. Yes, it is as good as it looks. One of the best restaurants in town is the reasonably priced and cozy Ostarija Peglez’n. We went twice and enjoyed their traditional Slovenian dishes the most. Lake Bled, and Slovenia in general, is a hidden gem in Central Europe. We are glad we made it there and imagine we will be back again someday to see more!